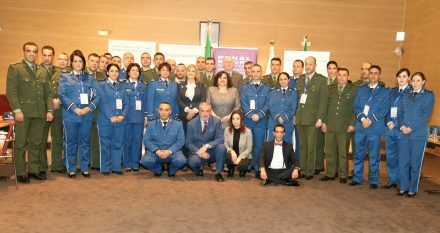 As part of a project promoting the administration of criminal justice in Algeria in line with recent international standards and best practices, PRI’s Middle East and North Africa (MENA) office organised a two-day workshop for the National Police’s newly established Human Rights Department in Algeria. 31 police officers and gendarmerie participated in the workshop, which focused on integrating human rights-based approaches within administration policies. PRI’s MENA office collected pre- and post-evaluations from the participants to measure the level of knowledge among the staff, and to develop promotional materials which will be distributed on a national level. The Director General of Algerian National Security, Major General Abdul-Ghani Hamel, stressed the importance of training and development for all officers and members of national security, towards mainstreaming a human rights-based approach in the Algerian Criminal System. The project is funded by the British Embassy in Algeria, and the Embassy’s representative, Andrea Quattrin, praised the strong friendship between Britain and Algeria, along with the effective and fruitful partnerships between the government and NGOs, which have been strengthened through PRI’s current and past work in Algeria. Find out more about the work of PRI’s MENA office here.